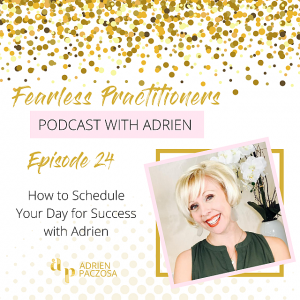 Every week, starting in the Fall of 2018, the Fearless Practitioners Podcast offers up practical business advice along with inspiring tips and tool for building your dream practice. Most importantly, Fearless Practitioners is about knowing that no matter how different our own paths may look, we’re in it together! You can listen, download, and subscribe on iTunes! The show will cover topics with expert clinicians, marketers, and others that will help grow your practice! Also with interviews I will share my own tips on mindset, journey and experience of growing a practice, habit and routines, money, and tools & tips of being a business owner. Fearless Practitioners is about being with you along the journey through it all. If you have not joined our Facebook group...what are you waiting for?! Tune in every week for practical business advice, and inspiring tips for building your dream practice. No matter how different our own paths may look, we’re in it together!